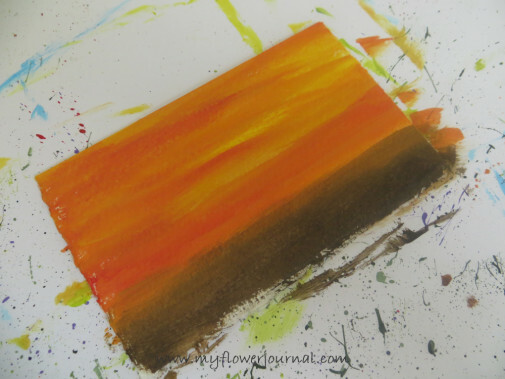 I have been splattering more paint and have some new ideas to show you and some helpful tips. 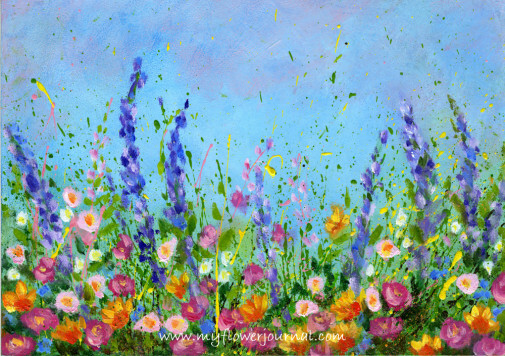 In my post last week, Create A Splattered Paint Flower Garden, I showed you how to do a watercolor sky and background then splatter acrylic paint to make your flower garden. I love using watercolor to create a sky, but when I invited my niece and nephews (ages 8-14) to do some splattered paint art I decided it would be easier to do the whole painting in acrylic. It doesn’t have same look as a watercolor sky, but by the time you splatter the paint most of the sky doesn’t show any way. It simplifies the process and the amount of supplies you need. So that is my first tip: To simplify, do the whole painting in acrylic on a canvas. 2. Try a variety of brushes to find the splattered look you like. The size, shape and texture of the bristles can make different splatters. This is the brush that works best for me. 3. Paint: If you don’t have a large stash and need to buy some purchase bold, bright colors and a large bottle of white. Then you can mix various shades. Its important to have a dark, medium and light or bright green. A dark brown is also helpful. 4. 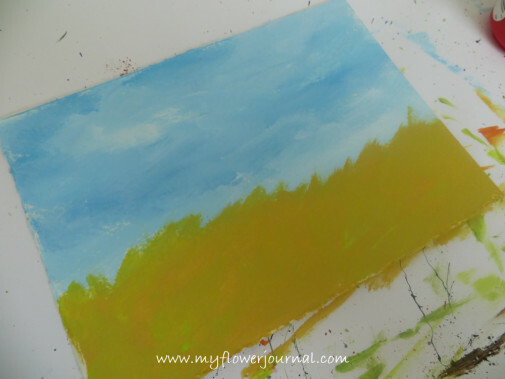 Prepare several canvases with different colors of sky or backgrounds. Experiment. You can’t tell which one will be your favorite until your painting is done. Maybe you’ll love them all. 5.Fixing mistakes: If you get a big blob you don’t like don’t touch it. Just leave it until the whole piece is dry. 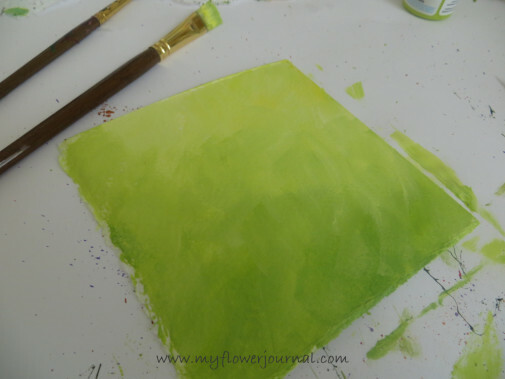 When you are doing the final dabs of color for flowers you can paint over the blob and make it a flower or put a few dabs of green or brown paint on it to help it blend in with the background. You can even do a few more splatters over it after it is dry to push it into the background. Trying to fix it when the paint is wet will make a bigger mess. 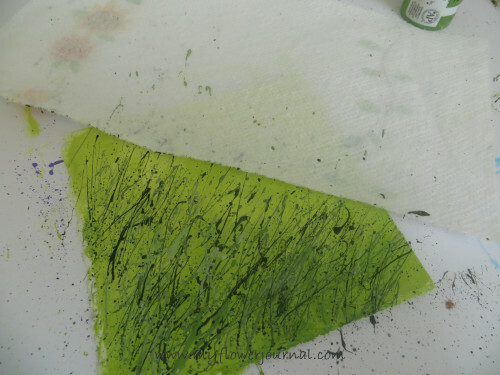 6.Have lots of paper towel ready to wipe paint off brushes. After you rinse a brush get the excess water out by squeezing it with a paper towel. Extra water in the brush when you dip in a new paint color can change the consistency of the paint and it won’t work as well. 7.Use baby wipes to clean your fingers when you change paint colors during the splatter process and any other time you need to clean paint off your hands. Here are the new paintings I did. I included a photo of the background before splattering and the finished painting. This is the first splattered paint flower garden I did about a year ago. It is the image I chose for my first website banner. 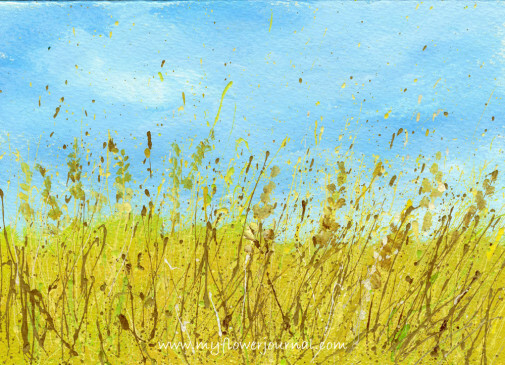 It is 5 x 7 inches done in acrylic for the background and splatters. The flowers were added in oil. You cans see there are many possibilities and variations for this type of painting. Use your imagination and see what new ideas you come up with. 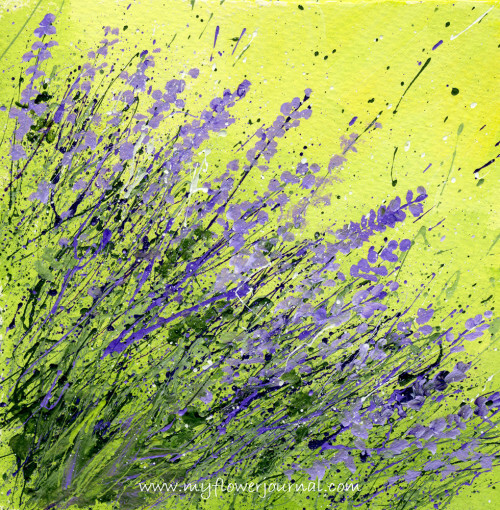 I would love to see what you create so send me an email or link with your painting. I have more ideas I hope to try this week and share with you soon. So check back and see what else I come up with! 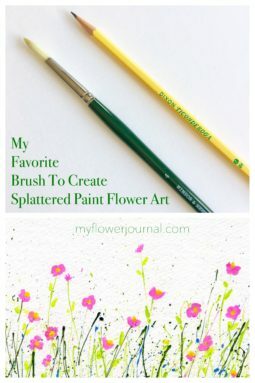 Video and FAQ To Create Splattered Paint Flower Art here. 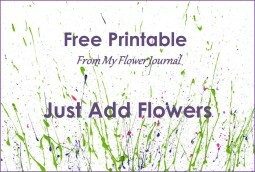 Free printable to create your own splattered flower art here. These are beautiful! What a great technique. WOWW!! Gorgeous work!. I love the impressionist quality of them and oh what beautiful sceneries :). Great tips too, I LOVE it! These are stunning. They look fabulous. Thanks for the tips. Absolutely gorgeous! 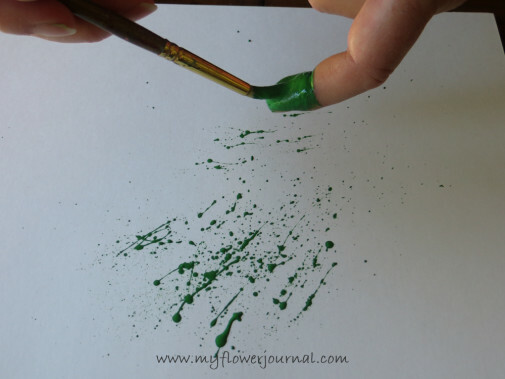 I am in awe of how you can make splatters into such lovely works of art! It is so hard for a non-talented person to understand how you come up with such BEAUTIFUL artwork after splattering.It just blows my mind and I would LOVE to be able to create something so pretty. Great job. Your paintings are absolutely beautiful! And you make them look so easy. Thanks for sharing at Inspire Us Thursday at Organized 31. Gorgeous watercolors! I love flowers too and wish I could paint them. I spend most of my time enjoying them from my back porch and photograph the gardens all the time. Your work is amazing! Oh my! I have got to try this. 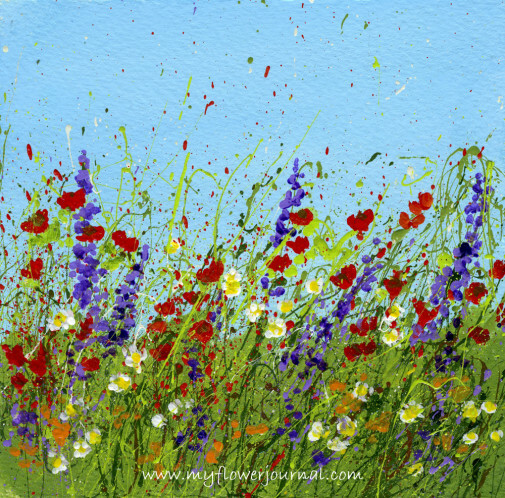 One of these splattered flower paintings would look wonderful in my master bedroom. I so do love your work! 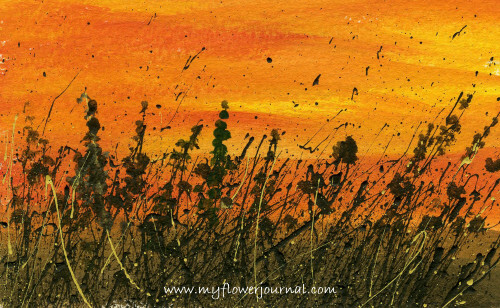 This one just captured the essence of Fall for me- I’m going to look at it lots today and just be inspired! Loved the break down and peak at your process! Thank you for sharing these tips! I’m recently getting back into painting and this sounds like a lot of fun to do! And yours turned out very well! Thanks for the ideas and tips! 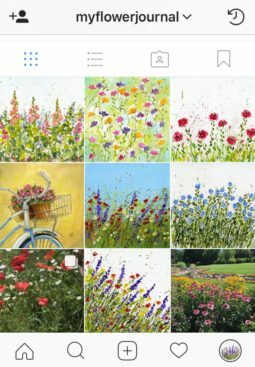 I love to do watercolor and flower paintings. I’ve also found that using tissue to dab away excess paint works very well. I absolutely love your art! You have inspired me to start creating again! Love this technique! Purchased the supplies and have been creating for a while now..Thank you for sharing your talent!